Delayo’s work and experience span the African continent. From midwives in Cameroon to Guinea worms in South Sudan to Ebola in West Africa, Delayo has seen it all. A native of Benin, Delayo grew up in the shadow of his mother’s work as a maternal and child health specialist with UNICEF. He eventually wanted to join her field because he saw the power that public health has to save many lives at once instead of just one at a time. Delayo studied in Mali to become a doctor. He finished his seven-year MD degree before moving to the United States to receive his MPH in international health at Tulane University. While in New Orleans, Delayo met his wife Ashley Burman, MPH who is currently serving with the Global Polio Eradication Initiative in Pakistan. After finishing his degree at Tulane, Delayo applied for many positions (including several fellowships with the CDC) and was rejected. He says that this was a frustrating time for him, especially because he realized that as a foreigner he had an even steeper hill to climb to find employment in the United States. He decided to travel to Cameroon to spend some time with his mother who was on assignment there. While in Cameroon, Delayo became friends with a man who was working for the United Nations Population Fund. This friend let him know about a midwifery project that was in need of someone with an MD/MPH background. Delayo applied for the position and got it. His initial three-month assignment extended to seven months before he returned to the United States. Back in the States, Delayo once again was faced with the prospect of finding employment. He thought that with his increased experience he’d easily be able to find work, but it still took time. Eventually, Delayo got a job with The Carter Center. His first assignment: South Sudan. Delayo had many people warn him when he left the States that he would be shocked by the conditions in South Sudan. He scoffed in his mind, rationalizing that he is from Africa, so certainly this would not faze him. He admits now that he was indeed shocked. The situation in South Sudan was stark: no water, no schools, no police. He vividly remembers the joy expressed by a few teenagers as they finished a shower with clean water and soap…their first ever. Despite the extreme conditions in South Sudan, Delayo emphatically states that this was his “best public health experience ever.” He lived in rural communities and worked with villagers to identify Guinea worm, ensure the effectiveness of ongoing programs and teach basic hygienic and safety skills. Delayo feels that he was not only able to have an impact on the individuals he grew to love, he also came to know the limits of his own physical and emotional capacity. They extended far beyond what he’d ever imagined. Delayo was sad to leave South Sudan when his eight-month stay was over, especially because of the friends (and adopted family…Delayo “adopted” two sons while he was there and helped send them to school) he had to leave behind. Following his experience in South Sudan, Delayo applied and was accepted for a position with the CDC Stop Transmission of Polio (STOP) program in Guinea. 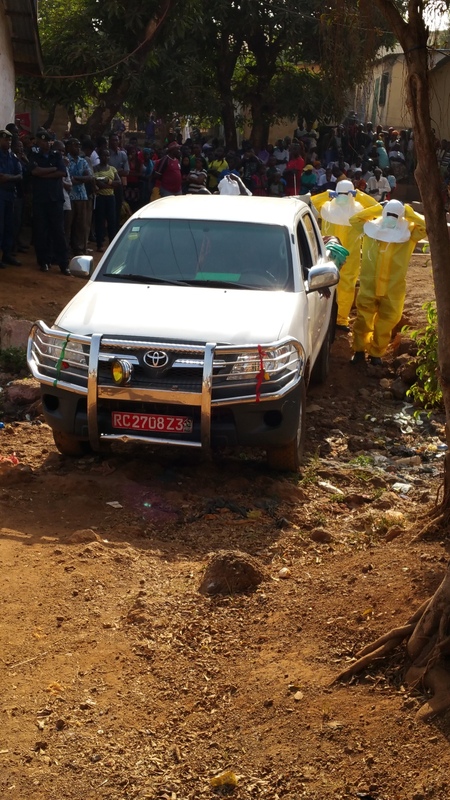 He arrived in 2014…just as the Ebola virus was spreading throughout West Africa. His plans to fight polio quickly changed as he was recruited to help fight Ebola. While many would be terrified to step foot into Africa during the Ebola outbreak, Delayo could not say enough about how incredible this experience was for him. He was at the focal point of a public health emergency, saving lives with the brightest and best in the field. He feels that he got eight years of public health experience in the eighteen months he worked in Guinea. In Guinea, Delayo worked alongside professionals from every main public health agency in the world, including the CDC. These individuals saw him at work and apparently liked what they saw. Within a short period of time, Delayo received four unsolicited job offers from the CDC. Delayo accepted one of those jobs and is now working as a medical epidemiologist for the CDC. His work focuses on polio eradication in French-speaking African countries. He will travel often to Africa to provide support for immunization campaigns conducted by national governments. He is also on standby for major outbreaks and other demands that emerge throughout the continent. Delayo admits that finding public health work, especially the influential positions we all dream of, can be really hard. It takes time, but he believes that if you work hard and then have patience and faith, the opportunities will come. Delayo suggests that volunteering and networking are important entry points to finding public health work. He says that you should keep trying to find opportunities to share your skills and meet people in the public health world. Start where you are, have patience, and have faith. Questions for Delayo? Click here.